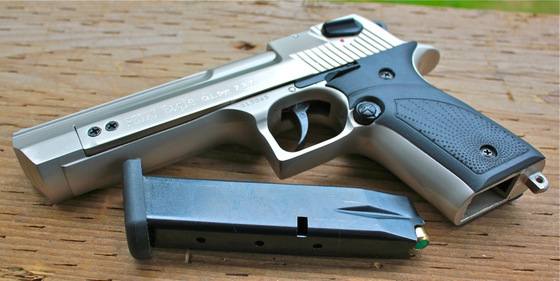 I don't usually do this but I am looking for a Retay Baron HK Blank Pistol, I know there are a few of them out there in Canada and I have a very good customer who I am trying to help out with this. If you have one and you are willing to sell it to me, please Contact me with your asking price! Where are those Retay Blank Guns I Ordered!!! I have to start off by please asking everyone to take a deep breath and try and relax just a bit... I have been afraid to look at my email because so many of you are asking about when the Retay Blank guns are coming and if I was you I would probably be emailing me too! This is what's happening. Remember the BB AK 47 incident, I know I'm trying to forget about it but it is now effecting how Air and Bank Guns are being handled in customs. The CBSA has been taking a fair bit of the heat with the whole "how did these so called (convertible) AK-47 BB guns get into Canada in the first place". And it looks like importers are now getting punished for the CBSA mistake by the CBSA holding onto flagged imported items for extended periods of time. Don't be fooled, this has turned into a money making opportunity for the CBSA as they have a $1000 per day warehouse storage fee on items being held for import. No this is not a typo, that's $30,000 per month so if you thought your 10x10 storage unit was costing you a boat load then think again! Thank God I am not an importer or I would be shutting down and perhaps thinking about getting a government job as government employees don't seem to be accountable to anyone and now make even more money by doing even less to help legit Canadian business owners - sorry if I seem a bit miffed, but I was arrested a few weeks ago and hand cuffed in front of my family and then released without any charges or apologies, yet the police still held on to all my business related items for over a week that I need to run my business. And now the CBSA is making it very difficult to import legal products that are the foundation of my business. And don't think this won't effect you! Because of these extraordinarily high CBSA storage fees, my importer/s will be forced to raise the cost of the items I purchase from them and in turn I will be forced into raising the price I sell these inflated items to my customers. And it has already started... I just raised the price of the Retay Blank Guns so for those of you that already "pre-ordered" you are now getting an even better deal. This of course is offset by the delay and I apologies for this but it is beyond my control. If you already bought a "Pre-sale" Retay blank gun then congrats on saving even more money. If you don't want to take advantage of the savings and would perhaps prefer changing your order to a differnt item, then please contact me with your order number and the item/s you would like to change your order to and I will apply a full credit towards the new item/s. It seems like we just had a Replica Airguns Giveaway Contest... Oh - that's right we did! So why on earth is there another giveaway contest so soon? What can I say - I'm just that kind of guy and why not get into the Halloween mood by making it a costume based contest this time. And in keeping with the theme around here, the costumes must be weapons based so basically any costume that is accompanied by a weapon of some sort is what you will need to take part in this contest. And you will have to make a short video of you in your costume and send me a video response to this Halloween Costume Contest Giveaway YouTube Video. 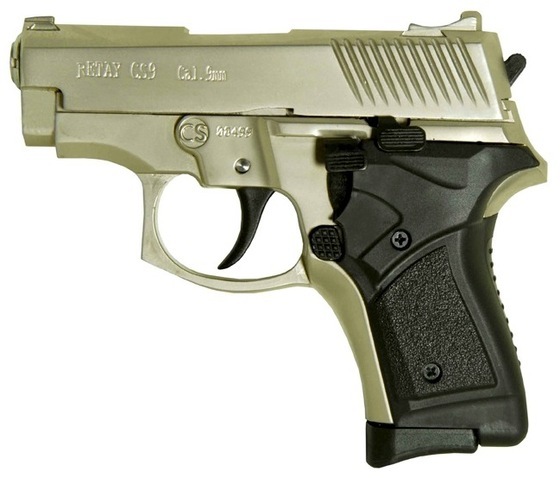 The winner (Ultimately picked by me) will receive a Retay Baron HK 9mm P.A.K. 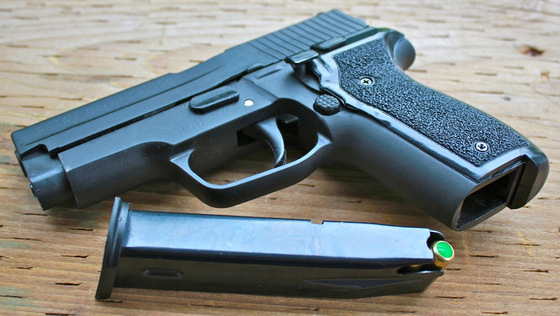 Blank pistol styled after the Sig Sauer P228. You need to make a video and send me a video response of you in your "Weapons Related Costume": Can be Military, Police, Rebel Force, Special Ops, Ninja, Viking, Caveman with a Spear… as long as you are in character and have a weapon of some sort! Contest ends at midnight on November 15th and the winner will be announced shortly there after. Ammunition Capacity: 13+1 round magazine. 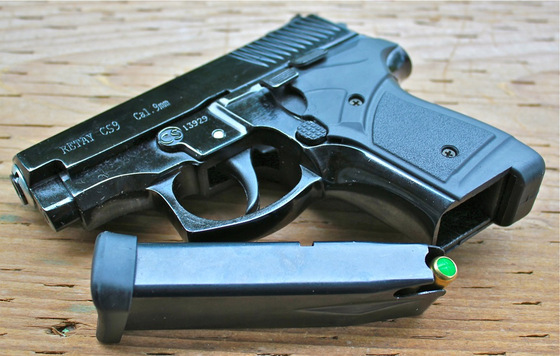 Trigger Pull: The trigger pull on the CS9 is fairly light with a shorter pull. 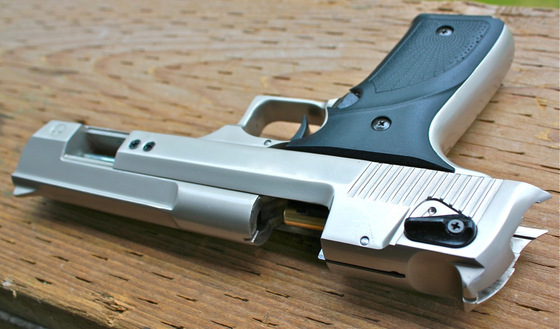 There is no double action on the Retay CS9 but it does have an exposed hammer making it easy to pull back and fire if you have a round already in the chamber but your gun is de-cocked. Realism: The Retay CS9, Smith & Wesson CS9 copy is a pretty good Smith & Wesson CS9 replica with the exception of the de-cocker and a few other minor differences. 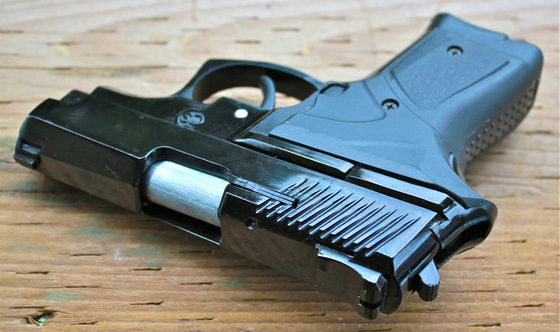 The basic gun shape and main features are similar to that of a Smith & Wesson CS9. Good hefty 2 pound weight. 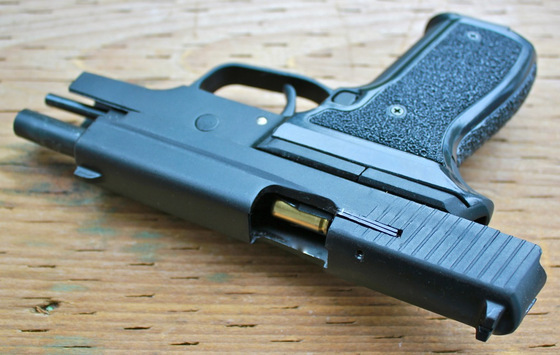 Black finish looks really nice on this gun - Satin would give it a nice tow tone look also. 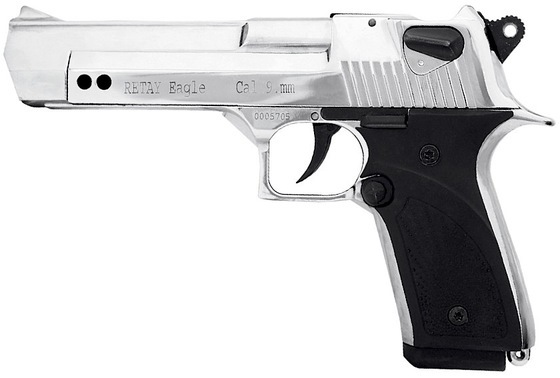 Decent replica of the Smith & Wesson CS9 semi auto pistol. Smallish gun but still holds 13+1 double stack magazine. Easy to field strip with the supplied tool. Fills the void the Zoraki 914 left behind in Canada. Could have been just a bit closer to the real CS9. I wasn't sure about the Retay CS9 at first and kind of preferred my Retay Baron HK and Eagle over the CS9 at first but this smaller Retay has really grown on me. It's almost the perfect size yet it retains a very compact frame while still having a mid sized guns weight and magazine capacity. And as mentioned, it kind of fills the void that the Zoraki 914 left behind when it was reclassified as a prohibited firearm in Canada. I will most likely be picking myself up a Satin version of this one to go with my black Retay CS9, hey you can't lose at this very good price. 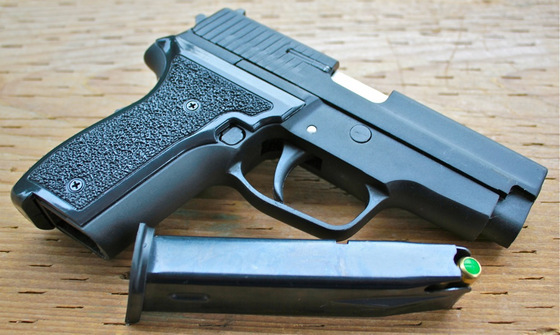 Another Retay blank gun added to the Replica Airguns Store is one of my favorites, the Retay Baron HK which is a very accurate copy of the Sig Sauer P228, I know because I own one! This model comes in Matte Black and Satin and is also available at a $24 discount right now as a pre-order item with stock being available right around October 20th. 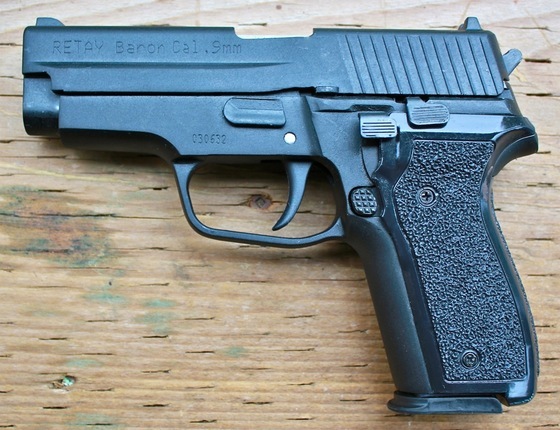 The Retay Baron HK is a nice copy of the Sig Sauer P228 mid sized semi auto pistol. It is a mostly all metal 9mm P.A.K. blank shooter that is front firing and comes in a hard shell case with a flare adaptor. 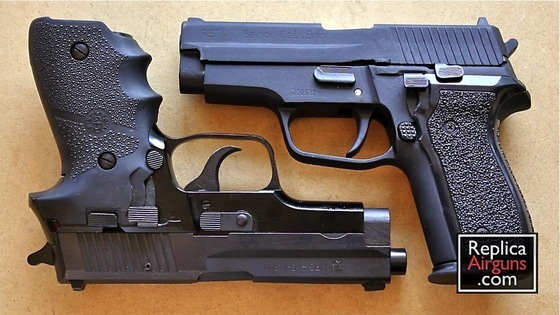 Additionally it utilizes a de-cocker and fires in single action only. I am happy to announce that I just added the Retay line of 9mm P.A.K blank guns to my Replica Airguns Store. The first one I am listing here is the Retay CS9. The Retay guns are expected to arrive ready for shipping on October 20th but if you take advantage of the pre order sale, then you can save $44 on the Retay CS9 by ordering it now. The Retay CS9 is available in Matte Black and Satin finish. 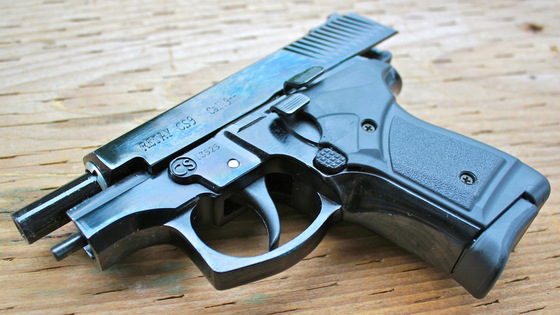 The Retay CS9 is a nice copy of the Smith & Wesson CS9 compact semi auto pistol. It is a mostly all metal 9mm P.A.K. blank shooter that is front firing and comes in a hard shell case with a flare adaptor. 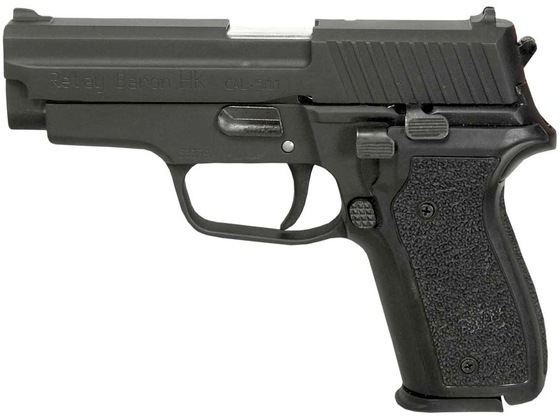 Additionally it utilizes a de-cocker and fires in single action only.